We’re continuing to use your feedback from our Nightlife Survey to plan the events for this term, and have just released info about our next Friday Night event on 15th February 2013. 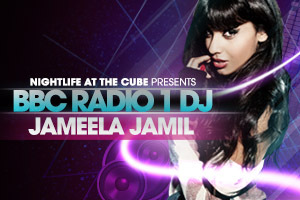 Our next headline act is TV presenter and DJ on BBC Radio 1’s Official Chart Show Jameela Jamil. Based on your feedback, the capacity for our events is now lower to make sure that you get the best night out possible and as always we’re still going to be bringing you the best value drinks on a Friday night – including our new cocktail “The Cubicle”. Tickets are on sale now from www.susu.org/boxoffice, plus get queue jump and exclusive access to the VIP Bar on Level 3 with the first 150 tickets bought! Find more details on our Facebook Event, and check out our Facebook Page to find out how you could win tickets next week.